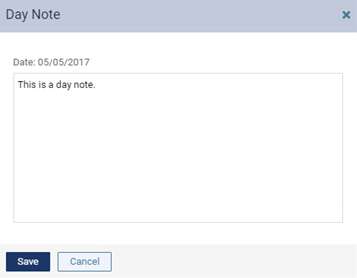 You can edit the text of any day note. Click (or tap) the blue Day Note icon (a gray icon indicates that there is not a day note). The Day Note dialog box appears. If you are viewing the schedule by day, the date appears in the upper-left corner. If you are viewing the schedule by week, in the Day Note dialog box, there is a tab for each day of the week. Click (or tap) the tab (for example, Mon) that corresponds to the day of the desired note. As needed, change or add to the note text.